Neat story and idea but sparse on details as usual. 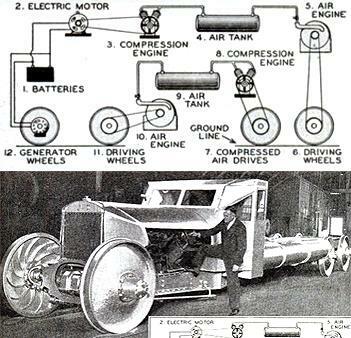 I love the idea of using compressed air as the motive force and note the inventor also appears to have developed an air powered car first which led him to the locomotive project. United States Patent 1904611- Automotive Vehicle – Boyette, William E.
This entry was posted on February 7, 2008 at 7:52 pm	and is filed under Alternative Science, Free Energy, Gee Willikers!! !, Invention, Orthodox Science. You can follow any responses to this entry through the RSS 2.0 feed. Both comments and pings are currently closed.